Unitron Stride Tempus 600 behind-the-ear hearing aids offer a superior listening experience by helping patients focus better on natural sound even in difficult environments. Designed using high-powered, intuitive hearing technology and a style emphasizing comfort, Stride is suitable for patients with a wide range of hearing loss. Easy-to-use volume and program buttons help conversations sound more natural, while the telecoil and easy t-switch make it easier to have phone conversations. 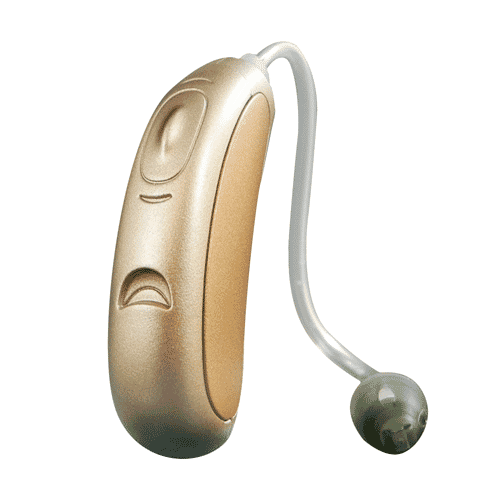 Unitron Stride Tempus 600 is powerful new sound processing technology that builds on the North platform it replaces. With Tempus, Unitron has taken their passion for hearing aids to the next level and addressed the challenging problem of improving conversations in noisy and crowded environments. The result is a big step forward in speech discrimination, sound localization and overall comfort. Unitron Stride Tempus 600 is a great choice for people that are less active and yet still want the latest generation of technology. Stride M uses a size 312 battery for high-output power and can be fitted using a traditional hook and tube or with thin tubes. It also incorporates a telecoil feature plus user controls and is the smallest Stride model. Unitron Stride Tempus – Compatible Accessories – can be selected as additional options to your hearing aid purchase. In addition to the 500, the Unitron Stride Tempus is available in 4 additional technology levels – Pro, 800, 700 and 500 – to help match automatic performance to your lifestyle and budget.